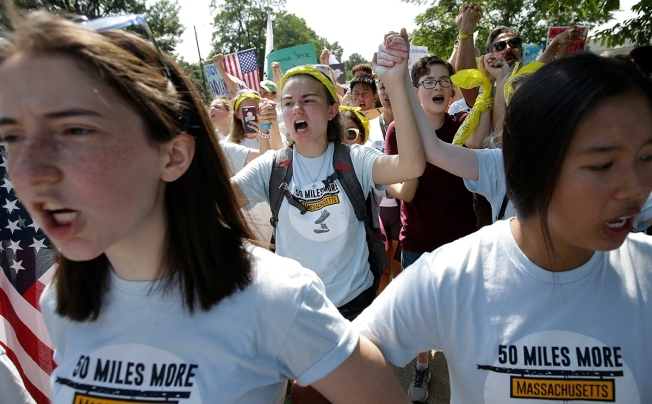 Youth activists participate in a 50-mile march on Aug. 26, 2018, from Worcester to Springfield, Mass. to call for gun law reforms. Youth activists including Parkland shooting survivor David Hogg will be speaking at Harvard University about how to engage young voters. The event is being called "Harvard Votes Challenge Presents: Activating the Youth Vote." Hogg is scheduled to return to Boston on Oct. 16 for a public discussion about civic activism and gun control at Boston Public Library. He has been a vocal advocate for gun control since the Feb. 14 shooting that killed 17 at Florida's Marjory Stoneman Douglas High School.